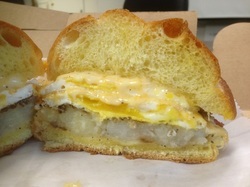 Dagwood Signature Sandwich Shop, a specialty sandwich restaurant that opened Mid-July (we apologize for the late mention) in Tappan, has released their “Rise & Shine” breakfast menu (previously meat, egg and cheese on a roll was the only breakfast option). All the sandwiches have interesting names (like their lunchtime counterparts) and are a mix of egg and breakfast meat concoctions. 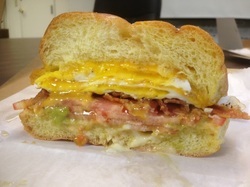 In an unconventional (and amazing) turn of breakfast options, these sandwiches are available all day long. A little background: Dagwood’s comes via “The Big Chz Stk” popup at the now shuttered DeKalb Market in Brooklyn from Chef Frank Cucinella. “The Big Chz Stk” cheesesteak is still on the menu with other expanded options for lunch. Look for an expanded piece on their lunch sandwiches on a future date.